This is the simplest scenario. The appliance is deployed using only one interface plugged into the network. Typically, this is used in a Secure Web Gateway installation. 1. Place the appliance in a stable and secure location. 2. Connect an ethernet cable from port 1 to your network; the other ports are not used. 3. Using the supplied AC power cord, connect the appliance to the power supply. If the appliance does not power on and boot automatically, use the power switch on the back panel. 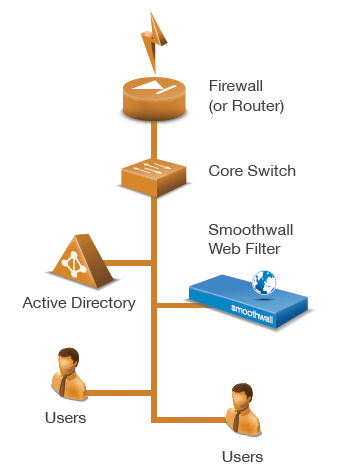 For a detailed description of how to register your appliance, see Accessing the Smoothwall .